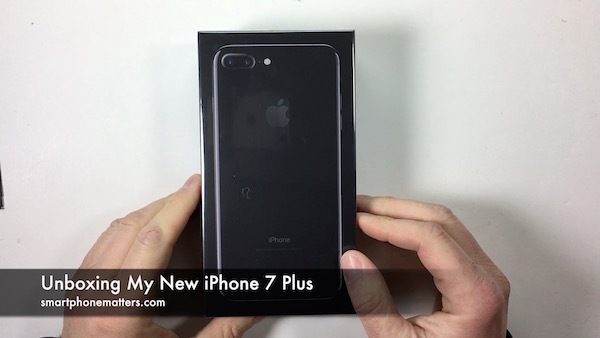 I picked up a new iPhone 7 Plus this week so I thought I’d do an unboxing video. The iPhone 7 was announced in September 2016 so it’s a little late for an unboxing video. I typically wait for Apple to release the SIM-Free model iPhone before buying, and I always wait until I can buy one in the Apple Store in New Hampshire. The SIM free model is the best model to buy use with prepaid wireless networks. The phone is unlocked and is compatible with the AT&T, T-Mobile, and Verizon networks. It should also be compatible with the Sprint network but you will need a Sprint SIM to use the phone on the Sprint network. I bought the 256 GB Jet Black iPhone 7 Plus. I knew I wanted a black phone but I had to decide between the Black and Jet Black. The black is a matte color and feels pretty similar to the iPhone 6s. The Jet Black is a high gloss black, and has a grippy feel. I’ve been told the Jet Black model will scratch easily. I decided on the Jet Black one. Alright enough about the color. Inside the box, was the iPhone 7 Plus, an Apple 5W USB Power Adapter, a Lightning to USB Cable for charging and syncing, EarPods with Lightning Connector, and a Lightning to 3.5 mm Headphone Jack Adapter. Also included in the box was the documentation, white Apple stickers, and a SIM tray ejection tool. I always leave all the accessories in the box new and unused so if I decide to sell the phone later or pass it along to a family member it has all the accessories. I have extra cables, chargers, and headphones so I don’t need to use them anyway. With the new iPhone 7 Plus, I’ve decided to to try out the larger 5.5 inch iPhone. I’m currently using an iPhone 6s and so I guess I’m going to find out if I’d like the larger phone. As always, I’m looking forward to trying out the new camera, I am particularly interested in the improved low light. Another reason to get the 7 Plus was because of the dual rear camera that includes both wide and 2x optical zoom lenses. I bought the 256 GB model. I shoot a lot of video. I shoot all my YouTube videos on my iPhone, so I like to have plenty of space. One of the big differences with the iPhone 7 is that Apple removed the headphone jack. The iPhone 7 isn’t the first phone to remove the headphone jack. You need to use headphones with a Lightning connector or the 3.5 mm adapter with a wired headset. You can also use a wireless Bluetooth headset or Apple’s new wireless AirPods. I plan on using a regular headset with the adapter. I think using the adapter is going to be a pain but I’ll give it a try.